Bitcoin trading volume has continued to decline at the Mt. Gox exchange, falling from around $30M to below $10M last week, a trend which has led to speculation on Bitcoin forums. 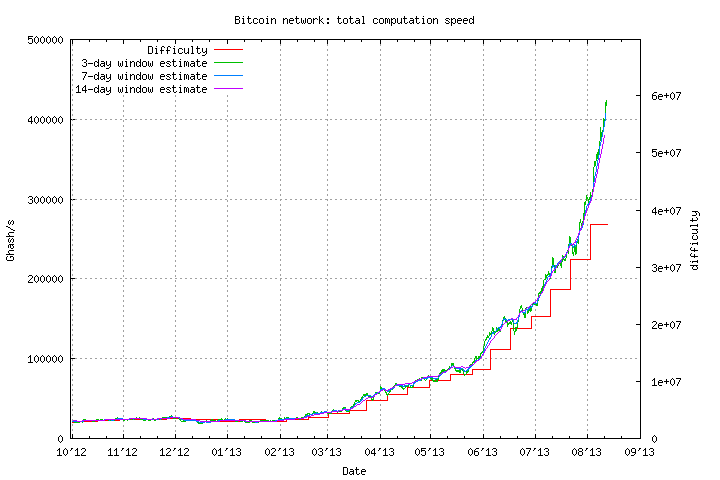 Nonetheless, bitcoin prices, at Mt. Gox at least, have remained aloft above $100 since breaking that barrier again at the beginning of August. Bitcoin is currently fetching $105 at Mt. Gox, $95 at CampBX, and $94 at BTCe and Bitstamp. 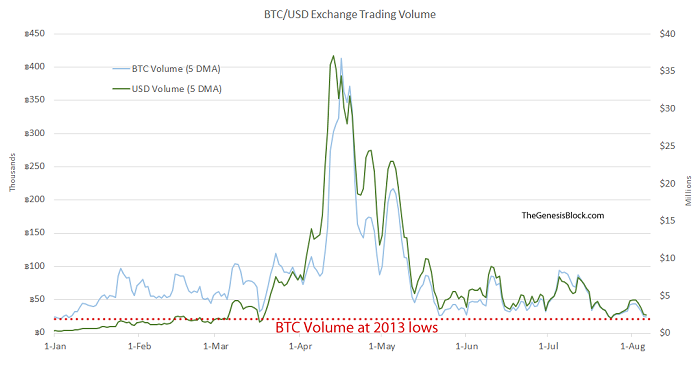 Meanwhile, transactional volume has risen from a low several weeks ago, which indicates growing usage in the currency at the same time that volume in trading has declined. Adding to the vexation of speculators is the skyrocketing difficulty in bitcoin mining paired with the record low operating margin of the mining itself. 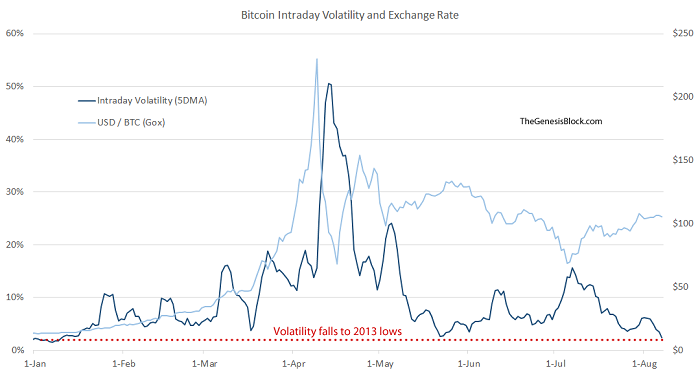 The Genesis Block earlier this week posted an analysis of the decline in both bitcoin volume and volatility, which author Jonathan Stacke related it to the compromised security of the Tor browser a week ago. However, Stacke also made the assumption that the DDOS attacks on the Silkroad, at the same time that U.S. Senators asked the Attorney General and DEA to investigate it in addition to bitcoin, directly triggered the collapse of ~56% in bitcoin’s price, rather than being a natural result of the spike to over $250 in such a short time. Such attacks may simply have been correlated to to the peak in Bitcoin’s usage and popularity occurring in April, however from TGB’s chart it appears the last one occurred at the end of the decline as well. Despite these challenges, and recent subpoenas in New York are simply the latest in regulatory obstacles– originally this was reported by the Wall Street Journal — the price of bitcoin remaining near $100 has led some speculators to ponder whether Bitcoin is dead or more resilient than ever. With the addition of XBT ticker to the Bloomberg terminal, though in testing mode only, bitcoin is, like the Greek Drachma, both a currency and not a currency in the eyes of Wall Street, and thus a Schrodinger currency according to Zero Hedge, which seems to be a fitting speculation for Erwin Schrödinger’s 126th birthday. * Correction: Commentators here and on reddit have noted that the increase in transactions may be artificially elevated due to the Android Wallet bug, which has caused many of its users to transfer balances. 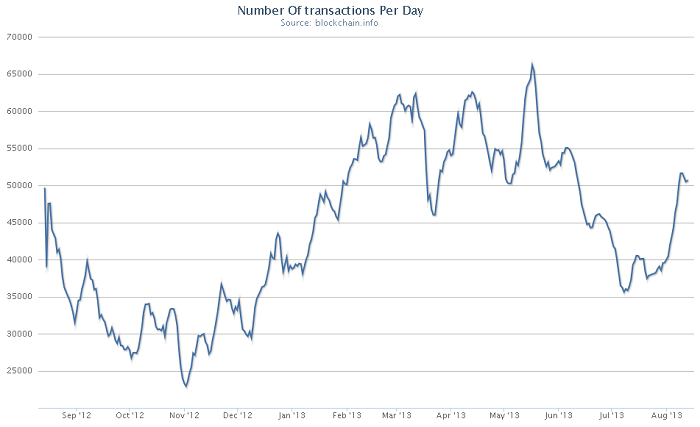 If that is the case, the divergence between transactions and trading volume disappears. Expect an artificial spike in transaction volume over the next week or two, as Android users update their software and “rotate their keys” and generate transactions to move their bitcoins from might-be-compromised keys. Thanks for the tip, Gavin! I just noticed speculation on this on Reddit as well about some unusually large block outputs.